It actually takes more words to explain what this script does than words used in the script itself. You might be listening to a playlist when you hear a song that doesn’t belong in that playlist—a Frank Zappa track ended up in a Frank Sinatra playlist, for example. You could: right-click on the iTunes LCD and click the “Remove From Playlist” item. If you haven’t disabled it, you’ll see a confirmation dialog asking if you realy want to remove the current track from the playlist. That’s three clicks so far. And then, after the track is removed from the playlist, iTunes stops. And to resume, you’ll either hit space bar to play the next track (which will be selected) or spend some time looking for a track to play next. Open this in Script Editor by clicking the little little script icon above. Save it named whatever you like with the Format “Script” (.scpt) in your ~/Library/iTunes/Scripts/ folder so that it will be listed in the iTunes Script menu. Follow the instructions on this page to add a keyboard shortcut. Oh yes. A keyboard shortcut. The first line ensures you don’t run this on a track playing from a media library playlist, because deleting a track from one of those deletes the track from the library. Then it stores a reference to the currently playing track, then plays the next track. Finally, the former current track is deleted from the playlist. The try block is used so that if the track can’t be deleted for some reason the script will fail gracefully. *The Next Track is a terrific podcast I co-host. I’ve mentioned my “Name New Playlist From Selection” script in the past. It emulates iTunes’ “Playlist From Selection” command with the added feature of asking for the playlist name before actually creating the playlist. This just seems to make sense to me rather than naming it afterwards. I’ve given it the same keyboard shortcut as the iTunes command (Shift-Command-N) so that the script is launched instead of the command being carried out. Here is an updated version of that script which adds an option to provide a playlist description. The default text presented will be “Created 4/4/2018”, or whatever the current date is. As you probably know: when you first mount a new CD and have a look at it in iTunes, the track information you see, for the most part, is not from the CD. (Well, there is such a thing as CD Text but it is not widely used.) Instead, this information is typically retrieved over the internet from Gracenote, a company that maintains an information database of virtually every CD. Ostensibly, the record labels provide Gracenote with the correct metadata for their products. But users can contribute “corrected” track data to Gracenote from many music apps, including iTunes. Crowd-sourcing this information famously has its, uhm, pitfalls. Recently, a Correspondent told me of an issue with finding return and linefeed characters in the Name tags of some of his tracks, metadata which were undoubtedly retrieved from Gracenote. These control characters aren’t supposed to be used in iTunes tags. In fact, entering a return character in most iTunes text fields is usually a signal to end editing. At best, iTunes does not accommodate line ending characters very well. The ID3 Tag spec may not permit them either, but I am not certain. Of course, I suppose it is possible that some other music app does allow return or linefeed characters in its track entries database. Depending on the app and the UI element that is rendering this text, the linefeed characters may not actually “feed” a new line but instead will be replaced with a space character (on the screen, anyway). This leads me to think that perhaps the source machine was a WIndows box; there was a time when “Mac or PC” made a difference in this regard. I still see Windows XP-era text effluvia in some Comments tags, for example. So, I created a simple script that removes any return or linefeed characters from the Name tags of a selection of tracks in iTunes. The iCloud Download column cannot be removed from a playlist in Songs View for very long (it can’t be removed at all from a playlist in Playlist View). You can hide it using View Options, but this will only be temporary and it won’t be long before it pops back up again. Its default initial placement seems to be adjacent to the Name column. Personally, I like having this column available since I sometimes want to know if a track I want to work on has a local file or one that resides in the cloud. But I have heard from Correspondents who would prefer this column to stay hidden when they hide it. Well, the trick I use is to keep it visible…but not visible. If you’re like me, you probably have the most important tag columns on the left side of a playlist in the browser window (while in Songs view). But I also keep non-essential/less-frequently-used columns far-off to the right so they are not visible when the playlist is horizontally scrolled full left in the browser window. So, click-and-drag the iCloud Download column all the way over to the right side of a playlist. If you do this in the Music library (with Songs selected) then every playlist you create subsequently will be configured the same way when in Songs view. Existing playlists will need to be manually adjusted. The shufflable property of a track does not have a corresponding Smart playlist criterion or Songs view column. So, looks like the only way to identify these tracks en masse is with AppleScript. Interestingly, the shufflable property works somewhat backwards. If the “Skip when shuffling” checkbox is set (and a checkbox when checked has a “true” value) the corresponding shufflable property is set to false; that is, “not shufflable”. This might be the opposite of what you’d expect. For instance, when “Remember playback position” is set to true with a checkmark, its correponding bookmarkable property is set set to true (yes, allow this track to be bookmarked). Just kind of interesting. A little. But its important to keep in mind when you want to detect the correct (and not opposite) value. set targetPlaylist to playlist "Skip Shuffle Tracks"
Open this in Script Editor by clicking the little script icon. 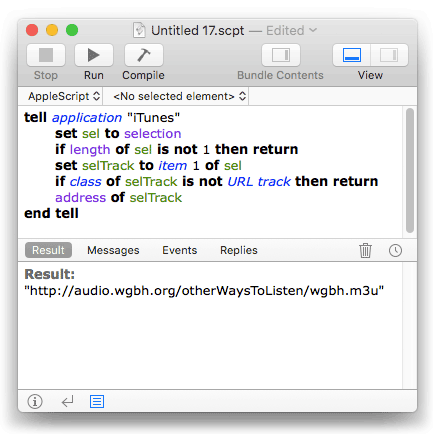 Save it named whatever you like as a Script Bundle in your ~/Library/iTunes/Scripts/ folder so that it will be listed in the iTunes Script menu. I have already created a playlist in iTunes named “Skip Shuffle Tracks” so make sure you do, too. if you want to use a playlist with a different name then you will have to hard-code that name in the script where I have used “Skip Shuffle Tracks”. Whenever you run the script it will get a list of track references from the Music playlist where each has its shufflable set to false. It will iterate over this list and for each track it will first see if the track already exists in the target playlist; and if it does not the track will be copied to the playlist. The second try block around the duplicate command ensures that if any track cannot be copied, such as a “dead” track, the script will skip it without erroring. I recently swapped receivers (or, I should say, amplifiers) in my office. I was using a decent mid-priced Sony receiver to power two zones of speakers: a set of Bose 301s and a “near-field” set of cheap desktop speakers and sub-woofer. I replaced it with an unused Onkyo amp I had purchased a few years ago. As a result of the switch, I no longer have a radio tuner in the configuration. Internet radio feeds seem to precede the part of the broadcast audio chain where the signal has the life processed out of it. I no longer have to tolerate crappy broadcast audio. Almost all my music sources are available digitally in one application, iTunes. Pandora is the only audio service I use requiring another app, but I mostly listen to it on mobile. I can AirPlay iTunes all over my house. The only downside so far is that I can’t listen to live local play-by-play sports broadcasts because, for various “contractual obligations”, these broadcasts can’t be internet-‘casted. One quibble I’ve always had with iTunes Internet Radio is that it’s not exactly easy to manage the stream tracks. Finding them in the Radio list can be a chore and sometimes stations will disappear and the re-appear with a different URL. There’s not much I can do about either of those issues. tell application "iTunes" to reveal playlist "__Radio"
I’ve assigned Option-Command-R as a keyboard shortcut to the script. This will create a new URL track in a playlist called “Internet Songs”. I then drag the track to my __Radio playlist and usually delete the “Internet Songs” playlist, although keeping it around isn’t a bad idea either. For a brief time, back when I was radio DJ, a station I worked at experimented with using “key segues”, whereby a recorded sounder would transition from a song played in one key to a song in another. Thus: Song in C fades -> sounder transitions from C to A minor -> seg next Song in A minor. Anyway. Since I was an Actual Musician (few and far between in radio), it was my job to assign the correct key for each song we played. Which essentially meant that I sat in a studio a couple of times a week with a CD player and a Casio keyboard and diddled around until I determined the key of each song we added that week. 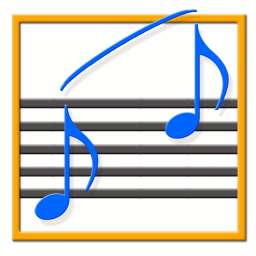 Nowadays, a lot of DJs use the musical key of the tracks they play to create “harmonic mixes”; tracks are mixed or segued according to harmonic rules. Some DJs probably aren’t musically inclined either, so there is software and databases and such that can supply the key for their tracks. Then all they have to do is check the Camelot chart to see what might sound good. Open this in Script Editor by clicking the little script icon. Save it named whatever you like as a Script Bundle in your ~/Library/iTunes/Scripts/ folder so that it will be listed in the iTunes Script menu. Launch the script and enter a name for the playlist; the default is “Multi-artwork tracks”; press OK.